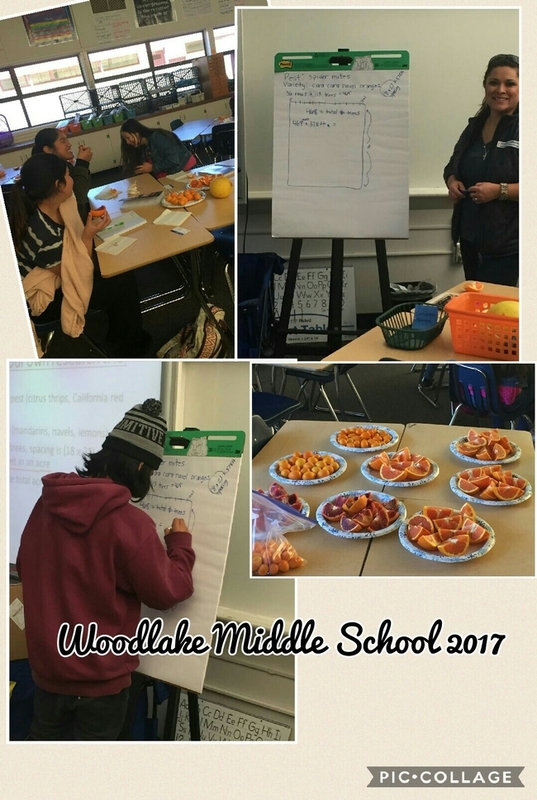 Staff Research Associate Sara Scott from the Entomology group at Lindcove Research and Extension Center taught 8th grade math lab students in Woodlake this week about citrus pests, citrus varieties and how to design their own research trial. They calculated total acreage, total trees, trees per acre and how much of an acre is 8 trees. They then calculated the amount of chemicals needed to treat 5 acres of citrus. The kids were engaged in the discussion and snacked on Cara Caras and blood oranges from Lindcove while they worked. This was a great example of linking learning with agricultural activities.